Photo courtesy of WSU WSU Raiders sophomore forward Bill Wampler makes a basket in the Cancun Classic first round against Penn State, Nov. 20 in Cancun, Mexico. 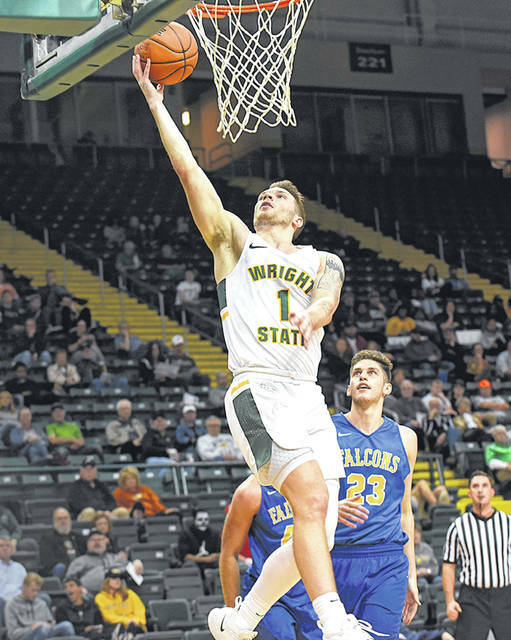 CANCUN, Mexico — The Wright State University men’s basketball team played its first regular-season game out of the country Nov. 20 in Cancun, Mexico, falling to Penn State 77-59. The Raiders are now 3-2 and PSU is 3-1. Four Raiders ended in double-digit scoring led by Bill Wampler with 17, Loudon Love 14, Mark Hughes 11 and Cole Gentry 11. Love made it a double-double with 10 rebounds with Skyelar Potter adding five. WSU shot 39.6 percent while Penn State hit shots at a 58-percent clip from the field and out-rebounded the Raiders 32-26. PSU had 16 turnovers to 15 for WSU, but outscored the Raiders off turnovers 21-9. “Defensively, we played scared. We were better in the second half, but the first half, we allowed them to get too many shots. We played like we did at Murray State, and we need to be strong every game,” WSU Coach Scott Nagy said. Penn State jumped out to a 7-0 lead to start the contest and was up 19-11 at the 12-minute timeout. The advantage continued to grow as PSU led 32-15 with six minutes remaining and 45-28 at the half. At the break, Wampler had 14 points while Love went to the locker room with four points and seven rebounds. Gentry scored seven in 15 minutes, though he had three fouls. WSU shot 38.5 percent from the field while PSU shot 61.5 percent, but the Raiders won the boards 15-14. Wright State had 10 turnovers and forced six. In the second half, Hughes got the Raiders off on the right foot with the first two points and heated up by hitting two threes as PSU led 58-42 at the 12-minute timeout. WSU narrowed the lead to 63-50 with 7:53 remaining, but the Nittany Lions extended their lead and won 77-59. Hughes collected all of his 11 points in the second half while Love had 10 points. The Raiders were scheduled to take on SMU in the Cancun Classic consolation game Wednesday night. Wright State will return home to play Cedarville at 7 p.m. Tuesday, Nov. 27 for its next game. For ticket information call 937-775-4934.
https://www.fairborndailyherald.com/wp-content/uploads/sites/50/2018/11/web1_WSUMen-1.jpgPhoto courtesy of WSU WSU Raiders sophomore forward Bill Wampler makes a basket in the Cancun Classic first round against Penn State, Nov. 20 in Cancun, Mexico. Story information courtesy of Wright State University Athletics, wsuraiders.com.